Memphis International Raceway (MIR) was proud to sponsor and host the Girl Scouts Heart of the South "Start Your Engines Powder Puff Derby". This inaugural event that was held at MIR on Saturday, November 21, 2015 and had 42 cars registered with 31 making the call on race day. Part of the thrill of a pinewood derby is designing, building and decorating the car to go the fastest. 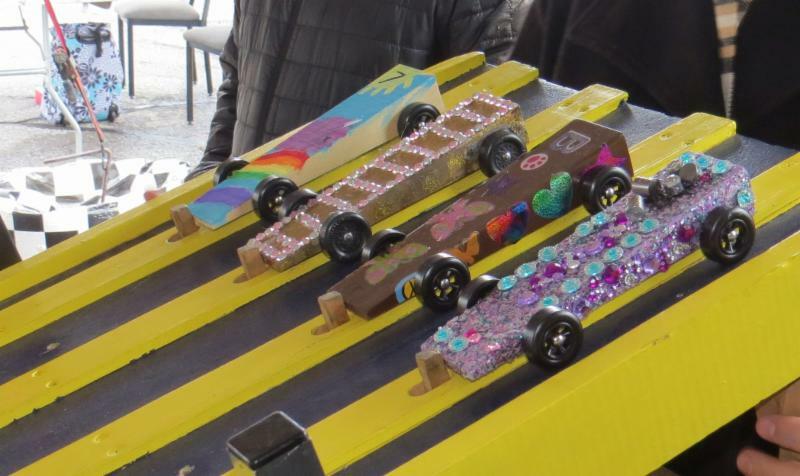 Although most cars were sparkled, glittered and pink, they were built for speed - Girl Scouts learned about engineering and physics principals, and the importance of aerodynamics, gravity, friction and air drag in racing. "Memphis International Raceway enjoyed having the girls out to show them the exciting world of racing," said Pam Kendrick, VP and GM of MIR. "The sport is enjoying an increase in female participants and we hope by hosting this Powder Puff Derby it will spark a girls passion for racing." Girls were giddy with excitement as each car underwent inspection before heading to the starting line. Family, friends and fellow troop members cheered on each girls car as they sped down the four-lane track during four heats. Each car had the opportunity to race down each lane. The best of four runs took the trophy at the end of the day. Girl Scouts were also treated to a meet and greet with Rt Turbines Junior Dragster racer Brianna Moore, and Rick's Powder Coating Super Pro racer Leigh Hubbard. The female racers answered questions from the girls, like how 14-year-old Moore was able to race without a driver's license or, how Hubbard got into racing and how fast her car is. Hubbard encouraged the girls saying, "It doesn't matter if you are a girl. If you have a dream of doing something go after it - in racing, in sports, in whatever your dreams are, you can do it." Girls were also able to see their race cars up close and hear about the engines and the speed their cars reach. "We are so thankful to Memphis International Raceway for introducing our girls to racing," said Girl Scouts Heart of the South CEO, Melanie Schild. "From the science to the sportsmanship, the girls were able to see how each part plays a vital role in being successful on and off the track."